LAKERVILLE is by UNUSUAL HEAT (1990), Black type winner, $143,707. Sire of 14 crops. 667 foals, 488 starters, 37 black type winners, 348 winners, $44,896,236, including Acclamation (Champion, $1,958,048), The Usual Q. T. ($1,531,240, Eddie Read S. [G1], etc. ), Unusual Suspect ($1,041,671, Hollywood Turf Cup S. [G1], etc. ), Golden Doc A ($580,126, Las Virgenes S. [G1], etc. ), Lethal Heat ($655,988, Hollywood Breeders’ Cup Oaks [G2], etc. ), Tucked Away ($582,956, Clement L. Hirsch Handicap [G2], etc. ), Gervinho ($422,140, Sir Beaufort S. [G2], etc.). LAKERVILLE first foals raced in 2018. LAKERBALL, 3 wins at 2, placed at 3, 2019, $160,825, Surfer Girl S., Pike Place Dancer S., 3rd California Cup Oaks. Angelo’s Pride, 3 wins, 2 to 3, 2019, $43,666. Coastal Starlite, winner at 2, placed at 3, 2019, $19,160. Lizzy`s Inthegame, winner at 3, 2019, $10,665. Little Tomato, winner at 3, 2019, $6,300. At 4: two wins, twice 2nd, Green Flash H. [L]. At 6: one win, Clocker’s Corner S., twice 2nd, San Simeon S. [G3], Sensational Star S.
GERVINHO (c, by Unusual Heat). 4 wins at 2 and 3, $422,140 in US. Won Sir Beaufort S. [G2], Zuma Beach S. [L] (SA, $60,000), Oceanside S.-R (1 div) (DMR, $67,140). 2nd Del Mar Derby [G2] (1 div), Silky Sullivan S.-R (GG, $20,000). 3rd Twilight Derby [G2]. LAKERVILLE (c, by Unusual Heat). Black type winner, see records. BROAD HOPES (f, by Broad Brush). 3 wins at 3, $101,280 in NA. Winner at 5, $58,144 in US. Won Denise Rhudy Memorial S. (DEL, $45,000). 2nd England’s Legend S.-R (BEL, $12,190). (Total: $159,424) Dam of 1 winner. Brandywine View. Winner at 3, $53,380 in US. Finally Remembered (f, by Red Bullet). 3 wins at 4 and 5, $34,319 in US. PARADISE FOUND (c, by Halo). 3 wins at 3, $128,722 in NA. Won Minute Man S. (PHA, $23,190). 3rd Peter Pan S. [G2], Jim Dandy S. [G2], Colin S. [G3]. At 5 Sent to Chile. Sire. Fondly Remembered (f, by Skywalker). Black type placed winner, see above. Fond O’Green (IRE) (c, by Irish River (FR)). 5 wins at 4 and 5, $57,869 in NA. MEMORETTE (f, by Memo (CHI)). 2 wins at 2, $158,325 in NA. 2 wins at 4, $738,428 in US. Won Beverly Hills Handicap [G2], Fran’s Valentine S.-R (HOL, $90,000), Calif Brdrs Champion S. (F Div)-R (SA, $84,525). 2nd Santa Anita Oaks [G1], Las Virgenes S. [G1], Hollywood Breeders’ Cup Oaks [G2], San Clemente Handicap [G2], Sunshine Millions F & M Turf S.-R (GP, $100,000), Generous Portion S.-R (DMR, $20,000). 3rd Ashland S. [G1], John C. Mabee Handicap [G1], Oak Leaf S. [G2], Santa Ana Handicap [G2], Sunshine Millions Distaff S.-R (GP, $60,000), Sunshine Millions Oaks-R (SA, $30,000), Fran’s Valentine S.-R (HOL, $18,000). (Total: $896,753) Producer. Bank Street. 3 wins at 2 and 3, $133,720 in NA. Where’s Scarlet. 5 wins at 3 and 4, $92,220 in US. Blushing Mary. Winner at 3, $56,352 in NA. Producer. Denali Birdstone. 4 wins, 3 to 5, $51,617 in US. PARKWAY DRIVE (g, by Fuzzy). 4 wins at 3 and 4, $140,780 in NA. Won Rushing Man S. (MED, $24,000). 3rd Rutgers Handicap [G3], Bet Twice S. (MTH, $4,800), Meadowlands Endurance S. (MED, $4,400). Forever Fond (f, by Georgeff). 11 wins at 3 and 4, $169,249 in NA. 2nd Gardenia Handicap [G3]. At 5 Sent to Ireland. At 9 Sent to Italy. Producer. Noon Rush. 10 wins, 3 to 6, $62,105 in NA. Mondelo (c, by Eastern Echo). 5 wins, 2 to 5, $103,459 in NA. 3rd Evangeline Downs Sprint Chp. Hcp (EVD, $3,300). Skylaunch. 13 wins, 2 to 8, $432,256 in NA. FONDRE (f, by Key to the Mint). Black type winner, see above. Mister Benjamin (c, by Triple Bend). 9 wins, 3 to 6, $98,719 in NA. Ohsaykid (c, by Oh Say). Winner at 3 and 5, $52,920 in NA. SCOTCH HEATHER (f, by Al Hattab). 12 wins, 3 to 5, $382,572 in NA. Won Gallorette Handicap [G3], Gala Lil Handicap [L] (LRL, $37,050), Lady Baltimore Handicap [L] (PIM, $36,920), Carousel Handicap [L] (LRL, $36,461), Flocarline Handicap (PIM, $28,958). 2nd Gallorette Handicap [G3], Geisha Handicap [LR] (PIM, $11,220), Luck Penny S. (LRL, $8,690), Flocarline Handicap (PIM, $6,650). 3rd Straight Deal Handicap [L] (PIM, $5,550), Carousel Handicap [L] (LRL, $5,560), Virginia Belle Handicap [L] (LRL, $5,610), Parasol Handicap (LRL, $4,507). 4th Delaware Handicap [G1], Betsy Ross Handicap [G3]. Producer. King Spargas (c, by Exclusive Era). 2 wins at 4, $15,504 in NA. SAYCASEYSRIBS (g, by Oh Say). 5 wins at 3 and 4, $111,040 in NA. Won Ocean Hotel S. (MTH, $24,000). 2nd Mister Diz S.-R (LRL, $12,000), Mr. Nickerson H. (PHA, $8,580). Concerned (g, by Highland Blade). Winner at 4, $13,215 in NA. 2nd Virginia Gold Cup Steeplechase S. [N]. 3rd Virginia Hunt Cup Steeplechase [N]. He Touched Me. 11 wins, 2 to 6, $92,598 in NA. Boundaway (f, by Bounding Basque). Winner at 3, $6,250 in NA. Producer. 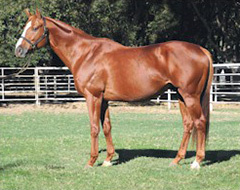 Zemosas Princess (f, by Majesty’s Prince). Winner at 3, $3,075 in NA. Spring Crop. 6 wins, 3 to 5, $74,950 in NA. Producer. October 8, 2018 Lakerball Scores Wire-to-Wire in Surfer Girl S.
Graded-placed stakes winner of $318,910 and full brother to a California champion, ran the fastest final quarter mile (:20 4/5) at Del Mar in 2012.